Steeped in history the Muller House was originally located at 129 Front Street in the Nob Hill neighborhood of San Pedro California and moved when Front Street was widened. The colonial Revival style house was built for the parents of Edward “Big Ed” James Mahar, Mayor of San Pedro. In 1901 shipbuilder William Muller bought the home for his family. 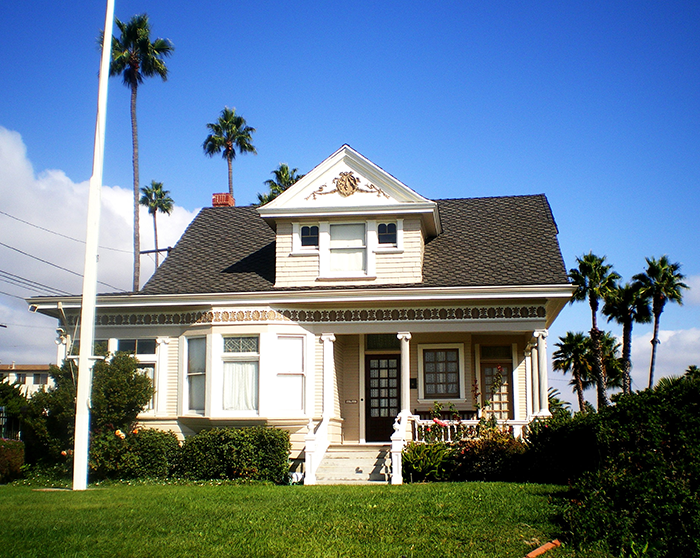 The house was owned by the Muller’s from 1906 to 1963, when they donated it to the San Pedro Bay Historical Society, who restored it and now operates it as a museum. Furnished as a family home to reflect the style of the 1920’s, it features exhibits changing monthly. The Muller House is now situated on a knoll at the south end of Beacon Street where it meets Crescent Avenue, overlooking the Harbor and Cabrillo Way Marina. Open from 1:00 to 4:00 PM every Sunday except holidays, the Muller House Museum offers guided tours. On the first Sunday of each month new displays are set up for viewing through the rest of the month. In addition to the weekly open house, a new popular series of informal talks are held at 1:30 on the first Sunday of each month.